Check out The Body Shop’s new range of cruelty-free makeup fronted by model Lily Cole. She is one of the few super models who has the brains that matches her beauty. Ms Cole is a supporter of the campaign against animal testing. This line of makeup created by her contains only vegetable and mineral extracts and the brushes are made of synthetic materials (but feels just as soft!). The claim: No bugs or shellfish were crushed to create the shiny, glittery makeup in this limited-edition range. There’s (glittery) lip gloss, lip and cheek domes, eyeshadow and eyeliner in this range too. First up, the Puff on Radiance ($34.90). 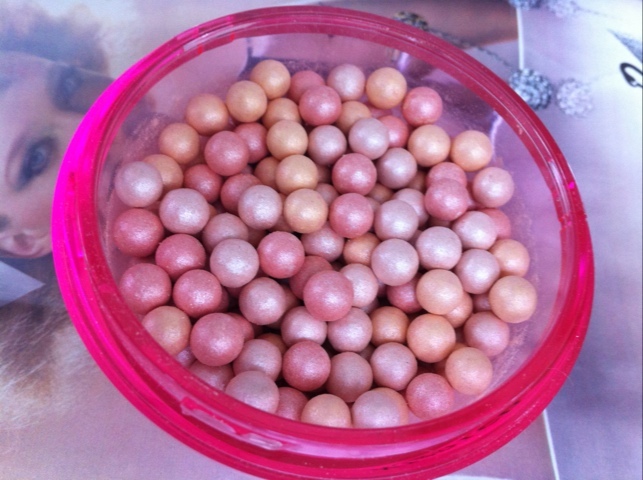 It reminds me of Guerlain’s famous pearl Meteorites. The powder gave my skin a healthy glow and sheen but is a little too glittery (i could see the specks) for me. So I recommend just dusting this on your cheekbones, decolletage and shoulders. The pink powder puff is so soft and cute but the way it picks up the powder ain’t great. Use your own kabuki brush. This pretty product will look great on your dresser. Then, we have the Pearl Radiance Primer ($39.90). It can take you awhile to blend this makeup base on your skin (the gel pearls don’t break down too well). But once I was done rubbing it evenly on my face, it left my skin looking slightly brighter and with plenty of fine glitter. These two products are good for those who like plenty of glitter in their makeup. Hello, yes it is, says the PR people anyway. The Body Shop is getting customers to sign a pledge on anti- animal-testing in their stores soon too. Maybe they are serious about the campaign. Every bit counts? Oh my! The puff on radiance contains: ethyl, methyl, Propyl and buthyl parabens! Parabens can give you cancer, you can loose the ability to have children, Children with life threading deseases++ Butylparabens has a high level of poison. Butyl parabens is actually forbidden in some countries! These parabens only affect you if you have hormons. So if you have no hormons you can use products with it.